Alas, now that the Arizona Cardinals have fallen to the Carolina Panthers, we face the prospect of a Super Bowl without bird-themed football teams. So, do you prefer rambunctious horses or big cats better? I got a good dose of seaducks this weekend up at the mouth of Irondequoit Bay; the most interesting species amidst the mixed flocks was a lone Bufflehead hobnobbing with Common Goldeneyes. 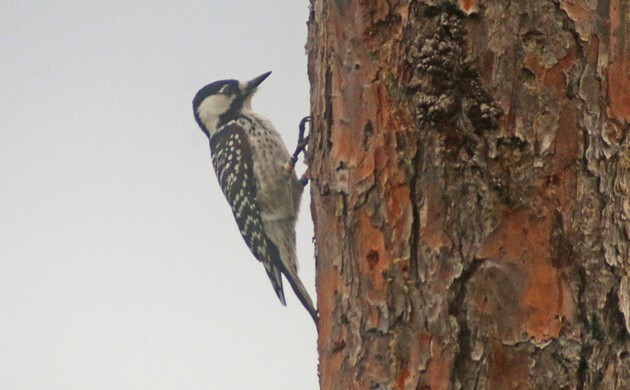 Corey’s Best Bird of the Weekend was any of the three Red-cockaded Woodpeckers he saw in the pine woods of Three Lakes Wildlife Management Area in central Florida on Friday during the “Central Florida Specialties” trip for the Space Coast Birding and Wildlife Festival. Such a rare bird is always a good sighting! American Avocet at Chomes, Costa Rica. Nine Hooded Mergansers swimming around the marina here on the Olympic Peninsula. Three were adult males, and they are such spectacular birds! Mergs and Buffies and Goldeneye, oh my! This weekend’s blizzard precluded birding, so I’m technically just limited to the Canada Geese and Cardinals that appeared while we dug out. But I prefer to go with the gorgeous male American Kestrel I watched Saturday night in the warm Tampa of my dreams. Southern Screamers and a Stripe-backed Bittern in Buenos Aires.